Whangapoua Holiday Park is located 5km from idyllic Whangapoua Beach on the Coromandel Peninsula. It is the closest holiday park to stunning NEW CHUMS BEACH - rated as one of the top 20 beaches in the world! This newly established holiday park offers a range of accommodation options from cabins to camping sites for tents, caravans and campervans. First established as a forestry headquarters in the 1960's nine original forestry workers cabins have been carefully restored and tastefully decorated. A modern kitchen and toilet/shower facilities complement the renovated cabins. Set amongst established trees, with bush and rural outlooks this is your place to relax and unwind. Explore the amazing local beaches, swim, fish, dive or walk to famous New Chums Beach, its all here! Make Whangapoua Holiday Park your favourite holiday destination. Ranked in New Zealand's Top 101 Must-Do's. New Chums Beach has been named one of the top 20 beaches in the world by Britain's The Observer and highly rated by Lonely Planet. This pristine beach can be accessed only by foot from the northern end of Whangapoua Beach. Take a picnic and experience this classic kiwi walk over rocks and through native bush. 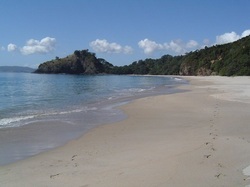 Described as a 'slice of Coromandel heaven' New Chums Beach is a 'must do' when exploring the Coromandel Peninsula. For bookings please click below !! © 2013 Whangapoua Holiday Park Ltd.